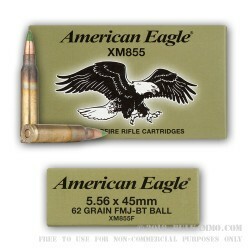 This is made on the same production line as the other venerable .223/5.56 rounds that Federal produces. 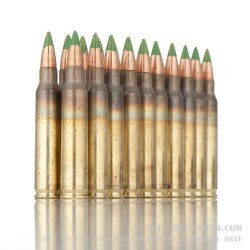 The near carbon copy of the M855 ammunition with the green tip and the penetrator bullet, this is a great round to have sitting on the shelf or out in the field enjoying. 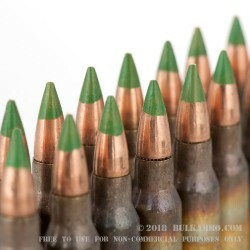 The heavier than standard bullet offers great performance out of the shorter twist rate barrels and the sweet spot for this particular round will be in the 1 in 7 inches or 1 in 8 inches twists, which will help to stabilize the bigger bullet and the resulting accuracy and reliability will be second to none. This is truly a great round for your AR platform rifle or others that take the 5.56x45mm. The heavier projectile has a profound effect on the wind shedding capabilities of the round and the resulting terminal ballistics on target. It is this type of benefit that makes the M855 clone shown here such a great purchase, even if the case lot number of rounds is a bit awkward at 420 rounds. 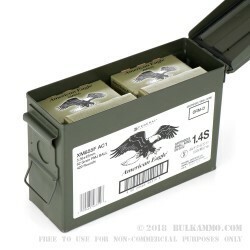 This is a 21 box case lot in a .50 caliber ammunition can that constitutes 420 rounds in total and is a perfect way to store the ammunition longer term. 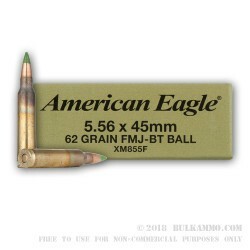 Because it is chasing the same specification as the M855 ammunition, but isn’t sold to the military; you get to land a great deal on the ammunition. Exactly what I wanted. Wish it was cheaper but who dosen't!!! Found exactly what I wanted without compromise. Quick processing and delivery. I will buy from them again. Zero complaints. All in all GREAT transaction. Don't waste your time shopping around. 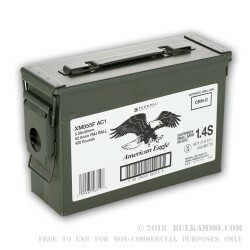 Just buy from bulk ammo and get exactly what you want and expect. If you don't like junk email then opt out before you confirm your order. I did not opt out and I get an email every few days. Not their fault. I chose to receive them. I have sence opted out and the emails stopped. Great company to do business with. On a scale of 1-10. I really and truly give them a 10. And 2 thumbs up! 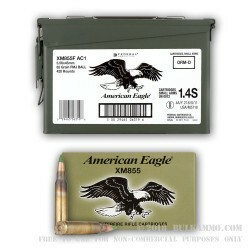 Q: Do these have the NATO cross to signify that they are real steel core rounds? 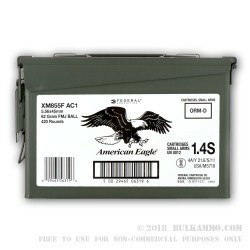 A: These rounds meet the NATO specifications and include the NATO cross. A recent sample from these cans include Lake City '11 brass. 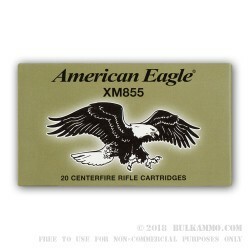 A: Yes, this XM855 ammunition has steel in the projectile and will attract a magnet.